The Annapolis Valley Mountain Bike Association's second annual Fall Festival Fundraiser is quickly approaching. The Fall Festival is a full weekend of mountain biking activities with all proceeds go directly back into improving and expanding the trails here in the Valley. Saturdays events will take place at the Kentville Participark AKA "The Gorge". The morning will consist of a trail building clinic, focusing on wooden features followed by an intermediate group ride of the local trails. Saturdays events are all free with donations being gladly accepted! See www.avmba.com for more details! Sunday's events will take place at the Woodville Community Hiking Trails AKA "The Links". 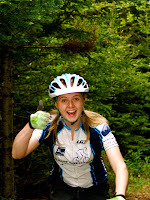 Activities include a 4-hour endurance race, a 2-Hour Youth endurance race, and a guided hiking tour of the trails. Trips for Kids bikes and helmets will be available onsite for people to use. There is a $25 registration fee for the 4- hour enduro and $10 for the 2-hour youth enduro. The guided hiking tour is free! The Trips for Kids art piece by Angela Melanson will be raffled off as the grande finale of the Fall Festival. Tickets for the raffle will be available on site $2 each or 3 for $5.